vacations in the early 1900s, before the Sydney Harbour Bridge linked the city to the Northern Beaches. Over the years, like many coastal suburbs, Dee Why has built itself upon it's greatest assets, the beach, the surf and the people. By doing so, it has played a major part in helping to build Australian beach and surf culture, and produce many world class surf champions along the way. The Place - Dee Why is situated 6 klms North of Manly and 25 klms from the Sydney city centre,which means a short drive for those working in the city, and a safe refuge from it. Dee Why was once described in a Rip Curl rep's report as the Western Suburbs of the Northern Beaches. Possibly true in many ways. 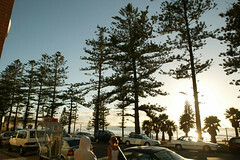 Dee Why is "Unit City" and the people are down to earth and of mostly simple values. It also attracts many day trippers from the west. However, things are changing. A few years ago the local council started pumping lots of money into Dee Why, especially the beachfront. With property developers forecasting a great future, Dee Why has become one of the Northern Beaches'major attractions. The beachfront has become cosmopolitan, with restaurant, coffee shop and retail stores offering ocean views for all. Combining the park, beach, swimming pool on the point, BBQ/picnic area and coastal walks, it's little wonder that Dee Why is attracting not only Sydney-siders, but international visitors as well. The Waves - Back in the early 1970s, a major surfing magazine named its top 20 surf spots in the World and Dee Why Point was included, a big call by today's standards. Nevertheless, when the Point is going off, it's a truly world class break, and the beach breaks are also pretty satisfying. Like most of the Northern Beaches, Dee Why works best in a westerly wind. Dee Why handles most swell directions, with the Point at it's best on a South-East swell. The Point throws on a big heavy barrel, and isn't the place for the inexperienced or faint-hearted. Local knowledge is a plus, and the localsthemselves are very protective of "their" Point. Dee Why turns it on best during Autumn and Winter, with Long Reef at the Northern end of the beach, and Curl Curl just over the hill to the South giving local surfers their best summertime options. Dee Why Surfing Fraternity - Like most Australian beaches, the local boardriders club is the engine room for surfers, providing a solid base for the development of mateship and performance surfing.D.Y.S.F. is the oldest boardriding club in Australia, a record the boys are very proud of. The club was formed in 1961 and Midget Farrelly, the club's first President, led the club to victory in the inaugural interclub contest against the Maroubra based Windandsea. The club boasted surfers such as Bob McTavish, Peter Cornish, Kevin Platt and original Vice-President John Dessaix and brother Terrence who helped develop the first Fibre-glass board in Australia. Family has always been an important aspect to the growth of surfing in the area. Families such as the Crawfords, the English brothers, the Dickensons and the Herrings have made Dee Why a powerful and close unit. Jeff Crawford steered the club through the wild 'n wooly '70s, the period of long hair and spirited parties. Russell Lewis was top dog in the water, winning a record seven straight club championships and the Australian Schoolboys Title. Peter Crawford was regarded as the world's best kneeboarder, winning many Australian titles. Other notable surfers of the 1970s included Ken Sasse, Jim Beasley, Les Turner, Jeff Breame and Mal Henderson. In the Eighties, the area fostered some strong talent and produced some great champions, including Gavin and Garth Dickenson and Shayne and Brett Herring who all went on to join the pro surfing ranks. D.Y.S.F. 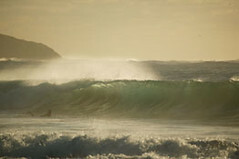 's greatest club feat came when a star-studden team finished third in the Quiksilver Surf League. Mat Hucker and Gavin Woods, both outstanding surfers, have led the club from its lowest point to its current flourishing state, and Matt is also the current club presso. The Nineties have ushered in a new generation of rippers at Dee Why, led by current pros Mick Klaunzer and W.Q.S. Top 50 finisher Toby Martin. With blokes like Toby and Mick charging for the club, Dee Why's short term future is looking good. There is no doubt that the talent pool continues to run deep with the current young crop of surfers challenging the club's established performers, and names like Lewis Spratt, Ryan Hayfield, Gus Horner, Tara Ryan and top junior Anthony McKay are all outstanding young prospects. The talent is there, but it will take attitude, discipline and vision to produce champions; let's hope that these will be brought about by the new breed. Dee Why has never been a place to over-encourage achievement or unity; if it ever does, watch out for our surfers. The future is bright for both D.Y.S.F. and the community in general, with more improvements on the cards. Dee Why could very well be one of the greatest suburbs anywhere to live, work, surf and play, and in April this year, the vision, unity and mateship of the whole community, surfer or non-surfer, will be put to the test as D.Y.S.F. hosts the first annual Mark Penches Memorial Contest. The whole town has pulled together to fund and run this event in honour of Mark, who was tragically killed by a shark last year. Maybe this will be the turning point for Dee Why to come together.